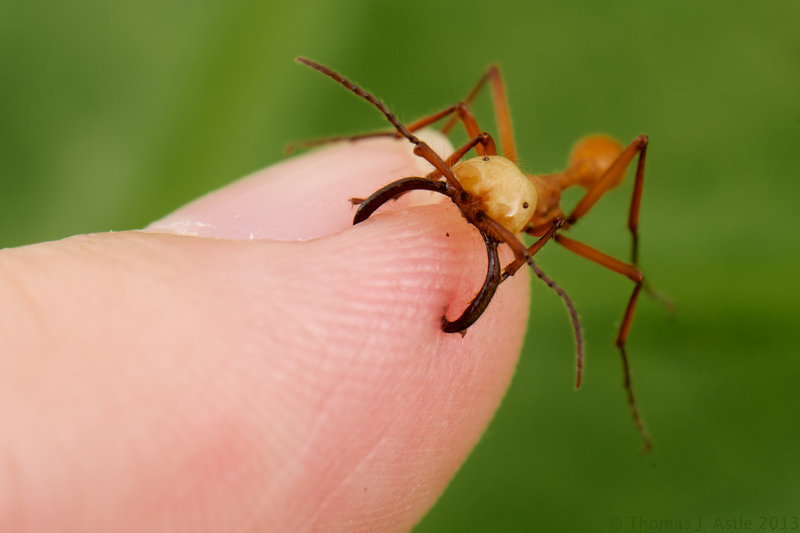 One of two species of army ants we saw in Belize. According to Alex Wild, one of the entomologists who ran the photo workshop, this is Eciton hamatum. This is a soldier caste — evolved for chomping vertebrates like me, who might attack the colony, although god knows why I would do that. The soldiers are much larger than the regular workers who do the raiding — in the case of this colony, we found them in mid-attack on a group of fire ants, so in terms of rooting interest from an admittedly selfish, two-legged-primate perspective, I say, go army ants. Anyway, Alex Wild “gave” me this soldier, and she stayed clamped to my finger for two hours. I took pictures of her, went to lunch, then took more pictures, before she finally bailed off. It doesn’t hurt as much as it looks. Honest. If you’ve always wanted pierced ears but don’t trust that teenager-manned booth at the mall, just get a couple of army ant soldiers. I’m pretty sure it’d be just as effective and at least as sanitary. Hello Thomas, I really enjoy your photography! I hope you do not mind, I used your photo on my site at http://www.facebook.com/formicarium I gave you credit on it as well, if you would prefer, I can delete it. Thanks for sharing!